Are you thinking of purchasing a home in Ponte Vedra, Florida? If so, Nocatee is the perfect location to call home. 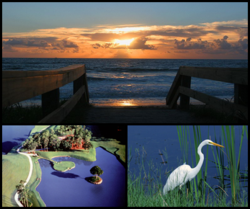 The variety and abundance of surrounding area attractions makes Nocatee THE place to live. Whether you are looking for a place to relax and unwind at Splash Water Park, or explore Northeast Florida’s nature in the Nocatee Preserve, there truly is something for everyone. Ponte Vedra offers an exciting mixture of excitement and relaxation. With world class golf resorts and spas, beaches, great shopping and restaurants, there is so much to choose from. The only thing better than visiting Ponte Vedra, is living in Ponte Vedra! Each Friday, we will spotlight an exciting area attraction as part of our 4-Part “Things to Do in Ponte Vedra” Blog Series. Check back next week when we take a closer look at the world class golf in Ponte Vedra.